Yvette’s specialty is whitework of different types – specifically, Mountmellick embroidery, Hardanger, and Ukranian drawn thread embroidery. She’s published three books on those subjects, all of which are available on her website, Vetty Creations, where you can also buy whitework supplies and learn about these types of whitework. So here’s a bit about Yvette’s ventures in the needlework book publishing field, in her own words. Fix a cup of coffee, sit back, and enjoy! Mary has very kindly invited me to write about my publishing experiences. I have read her features on both Trish Burr and Alison Cole, and have to say that my experiences are different again! I’m an Australian, living in Sydney. We are fortunate in Australia to have a wonderful stitching heritage – nothing that is particularly Australian though, because we are too young as a country to have developed something that is uniquely ours. However, here in Australia, we have some excellent needlework magazines that focus on a wide range of needlework styles, and some really excellent publishers of embroidery books. All these things mean that Australians are quite adventurous embroiderers, happy to look for something new to try. My mum tells me that even as early as Year 10 at school I had expressed a desire to be a book designer. After school I went off to study graphic design at university, and forgot about my desire to be a book designer, until my final year. I must have decided it was a good idea again, because I that’s what I did for my final year major project. After uni I worked for a number of years as a book designer for a major international publisher. I travelled about half an hour on the train each day, to and from work. 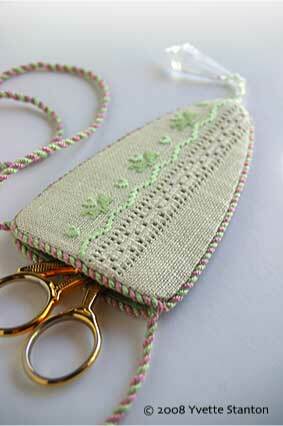 I filled the journeys with stitching – usually hardanger embroidery. It was interesting to note how many men used to ask me ‘Is that tatting?’ Somehow tatting seems to have seeped into the Australian male’s consciousness, though they have no idea what it is. Something to do with thread, I guess! One of the projects I spent a lot of time working on was a major hardanger embroidery piece. I had designed it with the express purpose of entering it in the Nordic Needle Hardanger Contest. I entered, and was fortunate to be one of the winners in 2000. It was scary posting off the precious embroidery for judging, and such a relief to have it safely back in my hands again at the conclusion. Somehow I got the idea in my head to send out press releases announcing my win. I sent some off to local Australian publishers of embroidery books in the hope that they might want to include a project or two of mine in a book that they already had going. I was completely surprised when two of them suggested that I might like to write a book for them. As a result, ‘Elegant Hardanger Embroidery’ was published in 2002. I enjoyed the process of writing it, and then was casting around for a subject for a second book. Being passionate about whitework embroidery, I really wanted to do something along those lines. It was suggested to me that Mountmellick Embroidery would be a worthwhile subject. So in 2002, I went to Ireland to research the beautiful floral whitework embroidery that originated from the town of Mountmellick. I invited my identical twin sister, Prue Scott to do this book with me. 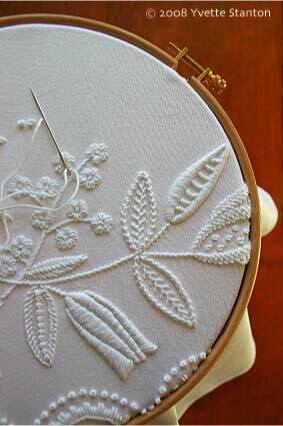 Prue is also an accomplished embroiderer, with the added advantage of being a trained botanical artist. In many ways, for a book on floral embroidery, she was the perfect partner. Our book ‘Mountmellick Embroidery: Inspired by Nature’ was published in 2004, and has enjoyed great success. Someone wrote to me even just this morning and said it was ‘the bible’ on the subject, which was lovely to hear. After some years, my book on Hardanger went out of print, and the publishers decided that they did not want to reprint. Having already had some experience both in the publishing and authoring sides of books, I considered self publishing. I knew it would be a huge learning curve, but as I believed in my book, I decided to give it a go. I redesigned the book, adding some new material, and released the self-published revised edition of ‘Elegant Hardanger Embroidery’ in 2005. My next subject was Ukrainian drawn thread work. I had done a basic class on this at my local guild, and saw that there was definitely potential for a book on it. I considered it for quite some time, began working on it, and then put it aside. I decided that it was too niche to work. Some time later I re-evaluated the book, and decided to go ahead. We did not feel confident going to Ukraine as a family, for me to research the book, because of the language barrier – I don’t speak Ukrainian! So instead we headed to New York (which my husband was just itching to visit anyway!) where there is an excellent Ukrainian Museum. I spent some wonderful days trawling through their collection of merezhka embroidery, and through the personal collection of the textile curator. The resulting book, ‘Ukrainian Drawn Thread Embroidery: Merezhka Poltavska’ was self-published in 2007. It has continually pleased me with its success. For such a terribly niche subject, it is now in its third print run. Around this time, I was surprised by the fact that our Mountmellick book went out of print. As ‘only’ the author, no-one had thought to tell me that its stocks were about to run out. But run out they did, and the publishers decided that the rights could be returned to us. Almost as soon as it disappeared from the shelves around the world, people started emailing me to find out if I had any stock. I didn’t because it had caught me completely unawares. The demand impressed upon me the need to get the book back in print as soon as possible though. I knew the book was good, but I was determined to make it even better. I revised the stitch instructions, adding more variations and changed them all into colour. I also added close-up photos of every stitched motif in the projects. I re-did the knitting instructions to be much more comprehensive, and added another even more authentic knitted fringe method. Two new projects were added. The fully revised and expanded edition was released at the end of 2007.
rnals and the cover. These are all the parts I feel completely confident in handling myself. I always get several other people to proof-read everything though. My biggest learning curve has been the selling and distribution side of the business. I think I will always be learning new things in this area, which doesn’t worry me in the slightest. It means I can always improve upon what I do. I have my books printed overseas, so have gotten used to dealing with shipping agents and the like. It is wonderful to have excellent distribution in Europe, America and Australia. As time goes on, I’ll work on expanding into other markets. I have already had one enquiry about translation rights, so probably further down the track I’ll look more into that area. So what have I been doing since the Mountmellick book revision? Several things! I began work on another book, but had to put it aside due to health issues. I have also completed the initial research on another book, which I am just so impatient to write! But because I am limited by health, I am working on a left-handed stitch dictionary which fits better with my current capabilities. I am so enjoying exploring stitches! And the book keeps getting bigger than Ben Hur because I keep finding more to put in it – more stitches and more detail. Life could change a little this year, as my youngest child is beginning school. It will mean that its very quiet at home. I could either go mad with the quietness, or relish the solitude and get lots more work done. We’ll have to see how things pan out! I just consider myself extremely fortunate to be able to do something that I love so much, as a job. I’ll never get rich (publishing never makes anyone except the most famous authors rich) but I’m certainly having fun! If you’re interested in whitework, you’ll find that Yvette’s three books are excellent sources of how-to information. I’ve heard her book on Mountmellick embroidery described as “THE book” on Mountmellick, as well as the “bible” when it comes to this type of needlework. It’s an excellent resource! Besides ordering through the book page on Vetty Creations, if you live in the States, you can order her books through Nordic Needle. Yvette also has a blog called (appropriately!) White Threads. Here, she keeps us up to date on her work, her embroidery projects, book publishing plans, and various other tidbits. Yvette doesn’t just do whitework – check out her post on her completed Elizabethan embroidery piece. It’s stunning! Right now, Yvette’s exploring the possibility of publishing a stitch dictionary for left-handed embroiderers! I find this really exciting, not because I’m left-handed (I’m not), but because I teach a lot of left handed children and adults. If her other books are anything to go by, I know this is going to be a wonderful resource! So I’m looking forward to that with my fingers crossed! Thanks, Yvette, for the fun and informative article! Mary, I really enjoy these profiles. May you do many more! Yvette, bless you for putting together a stitch guide for lefties. I recently took a class that included plaited braid and the instructions were actually written for lefties (unintentionally, I think). It was kind of fun watching the righties try to reverse the instructions on-the-fly! I must say that I took a tiny bit of delight in listening to their grumbling. What a talented woman! Thanks, Mary, for this wonderful peek into her world. I was excited to see Yvette Stanton featured on the blog! I bought the first edition of the Mountmellick book a few years ago, and got the revised edition when it came out. I have all the Mountmellick books that can be found on the web (at least I think I do), and Yvette’s book is far and away the best there is. Hi!! Beautiful write up of the various embroidery done in different parts of the world.Is there YouTube video of yours where I can learn these embroidery specially the white embroidery. Next Next post: Another Needlework Sale Notice….